Running Windows on Mac, number of options available to Windows-based software applications. Mac also runs on the same Intel chips that have been used by Windows operating system. Apple also provides Bootcamp to dual-boot Mac with Windows. Apart from this, Virtual Machines like VMware and Oracle VM VirtualBox can be used to emulate Windows to run Windows apps on Mac OS X system. You can use all these options to run a Windows apps when you have purchased the Windows Product with license. If you want to run a single Windows Application, it is not worth to buy the license for Windows. Also, the process of installing Windows in the Mac OS X is the tiring process, you have to wait patiently for some time. Now We have many alternate ways to run Windows Software application in Mac OS X without installing Windows OS. By using these methods, you can run Windows apps as a native Mac OS X applications. Wineskin is such a tool which can be used to make ports of Windows Software for Max OS X. It works like wrapper around the Windows Software, and you can run those software in your Mac OS X. These Wine Wrappers are just like a normal mac *.app application. You can open these Windows programs just like a native mac app. These technique is used by the Transgaming who have created Cider which can be used to do professional ports for many games. These compatibility wrapper technologies are fast and can run Windows apps without installing Windows. If you need any Windows Software for Mac, try to search the Mac version of it. Most of the popular Windows applications are also available for Mac like MS Office. 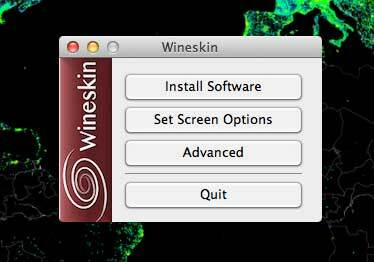 If you haven’t found it, install WineSkin Winery to run that Windows Software in Mac. 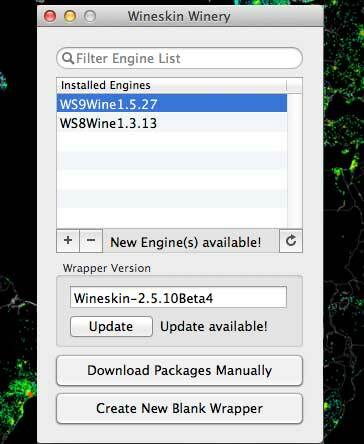 Launch the WineSkin Winery and install the latest engines by clicking the plus sign. Because some older Windows Software may not run with newer Wine. After the installation of a couple of latest Wine engine, click the Create New Blank Wrapper and enter the Name of the Windows App like Notepad. Now the Notepad Wrapper is created. Run that wrapper from your Home Folder Applications. You will get small Menu box and click the install software option. 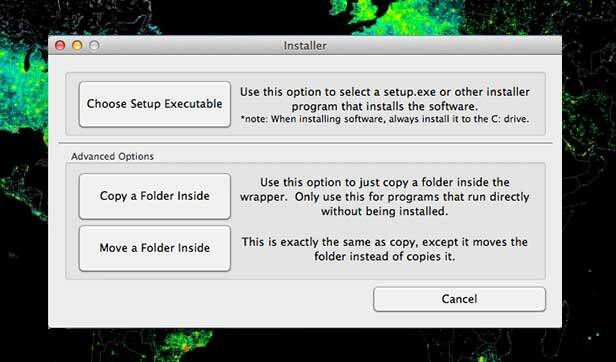 It will generate Window like below, asking you to choose setup.exe or run the program directly from the folder you have chosen. If the Windows file is portable and run without installation means choose the folder option to run that program. Choose setup.exe when the software needs installation in your Mac. Now Windows Installation setup will run and proceed further to complete the setup. That’s it pick the executable file and launch it.